This week, CERN TH hosted a workshop entitled Interplay of Collider and Flavour Physics. Flavour physics is concerned with processes involving transitions between different generations of the Standard Model fermions. In recent years, flavour physics has seen considerable experimental progress, prompted mainly by the results from the B-factories. However, in spite of great expectations, these experiments brought nothing but disappointment, despair and loss. In short, all the observed phenomena can be well described by the vulgar flavour structure encoded in the CKM matrix of the Standard Model. This means that new physics, if it exists at the TeV scale, must be highly non-generic; to a good approximation it must be either flavour blind or its flavour structure should be correlated with that of the Standard Model. 90% of the theory talks in the workshop dealt with the MSSM, which is kinda funny given that the MSSM has nothing to say about the origin of flavour. Luckily enough, Christophe Grojean (on behalf of the local tank crew) reviewed another approach to TeV scale physics in which flavour is built in. This approach is commonly referred to as the RS scenario (where RS stands for Raman-Sundrum) and its modern incarnation is pictured above. The fermion mass hierarchies in the Standard Model follow from different localizations of fermions in the fifth dimension. 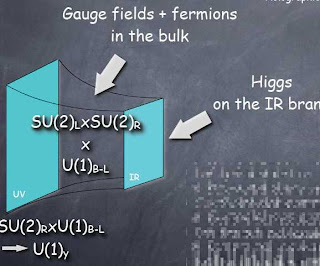 Light fermions are localized close to the UV brane and have little overlap with the Higgs boson who lives close to the IR brane. The third generation (or at least the top quark) lives close to the IR brane, thus interacting more strongly with the Higgs. In this way, the fermion mass hierarchies in the Standard Model can be reproduced with completely anarchic Yukawa couplings between the Higgs and the fermions. The RS scenario predicts new physics states, for example the Kaluza-Klein modes of gluons, with masses not much larger than TeV, as required by naturalness. If couplings of these KK gluons to the three Standard Model generations were completely random, the KK gluons would mediate flavour violating processes at the rate incompatible with experiment. The situation looks however much better. It turns out that the same mechanism that produces the fermion mass hierarchies also aligns the couplings of the KK gluons in such a way that flavour violating processes are suppressed. Most of the flavour violating processes predicted by the RS scenario are within experimental bounds if the mass of the lightest KK gluon is larger than 4 TeV (the same bound follows from electroweak precision tests). The exception is the parameter $\epsilon_K$ describing CP violation in the Kaon system, that comes out a factor of few too large for a 4 TeV KK gluon. This means that the Yukawa couplings should not be too anarchic in the end and we need additional flavour symmetries...or maybe this is just an accident and the problem will go away in a different incarnation of the RS scenario. Future experiments (not only the LHC, but also super-B-factories, or MEG and PRIME) should give us more hint. Here you find the slides from Christophe's talk, here those from other talks in the workshop. In 2008 CERN will organize the TH institute Flavour as a Window to New Physics at the LHC to bring even more flavour to life here at CERN.